Literally New Day, Noe-rooz combines two Persian words; ‘noe’ meaning new, and ‘rooz’ meaning day. Celebrating renewal in nature, this ancient new year festival marks the first day of Spring in the Northern hemisphere. The Norooz table display includes ‘Haft-Seen’ which comprises seven symbols of wealth, health, and happiness. Many Norooz tables will include goldfish in a bowl to signify life – and they may even outlast the festival! 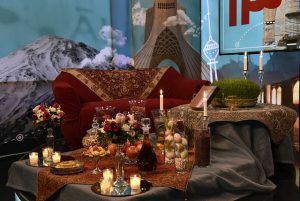 Although Norooz is closely associated with Zoroastrianism, almost all Persian-speakers celebrate the festival which takes place on the Spring equinox. This is the moment that marks the end of winter, when the days begin to stretch out noticeably and the nights rapidly shorten. Light is celebrated and highly prized by Zoroastrians, whose numbers in Iran, according to the 2011 census, is barely over 25,000. Yet, the veneration of light remains a strong feature of Persian culture. For Persian believers, the true new life in Jesus, the Light of the world, has already come. It is on Him that they cast their cares and burdens, awaiting with all other believers His ultimate triumph and everlasting rule.